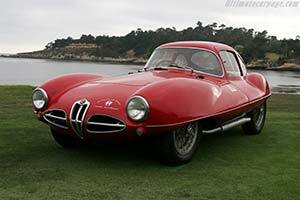 At the end of the 1951 season Alfa Romeo announced the company's official withdrawal from motorsport. The racing department was not shut down, but instead used to test experimental chassis and engines. Due to their advanced nature these projects could also easily be used for racing, which was exactly the intention of the first new experimental Alfa Romeo unveiled in 1952. Developed jointly by the Milan based manufacturer and coach-builder Touring, this C52 went into history as one of the most famous designs of the 1950s. Except for the suspension, the C52 was a completely new design. Derived from the 1900 road car the front wishbones and rear live axle were bolted on a state of the art tubular spaceframe chassis. It offered superior rigidity to the previously used (tubular) ladder frames, but not at the expense of additional weight. A slightly bored out 1900 engine with a new aluminium block that replaced the cast-iron of the road car's unit. Equipped with two twin-choke Weber Carburettors, the 2 litre power-plant developed an impressive 158 bhp. The designers at Touring focussed on creating an aerodynamic body. They did not look at the frontal area alone, but also tried to cut the influence of side winds. The result was a very unusual round design with large overhangs on either side of the cockpit and a full under-body In the midst of the 1950s UFO craze the car was quickly nick named 'Disco Volante' or flying saucer. It proved to be a very efficient design, enabling top speeds of 220 km/h, but at these speeds the car suffered from pretty serious lift at both ends. After a successful first test at Monza, the Disco Volante was entered at Le Mans for Juan Manual Fangio, Froilan Gonzales and Franco Cortese to drive. For reasons unknown the Alfa Romeo team did not show up and the car was never raced. Two more cars were built with a similar specification in 1953; a Coupe and another Spider. Whereas the Coupe followed the lines of the original Spider, the third example had a 'Narrow-Hipped' bodywork designed for tight hill climbs for which the Disco Volante's wide body was not ideally suited. None of the three Disco Volantes were ever raced, but did inspire the design of a series of six cylinder racing cars that debuted in 1953. Although some consider these to be Disco Volantes as well, the absence of the spaceframe chassis really does not justify that. Clothed by Touring with Coupe or Spider bodies these 6C 3000 CMs raced with considerable success. The new chassis was not abandoned and was first used again for the Sportiva concepts of 1954. The first real application of the spaceframe was in the TZ racers of the 1960s. Both the original Spider and the Coupe are currently owned by the elaborate Alfa Romeo Museo Storico based in Arese, Italy. In a rare public appearance the Coupe is seen here at the 2005 Pebble Beach Concours d'Elegance where Alfa Romeo's 90th anniversary was celebrated.